Former Maryland Gov. Martin O’Malley; South Bend Mayor Pete Buttigieg; Robert Bernhard, Notre Dame’s vice president for research; and undergraduate Alicia Czarnecki are the panelists participating. They will discuss the importance of city officials and universities working together to develop innovative solutions to challenges facing cities, while providing unique educational opportunities for students to work on real-world problems. 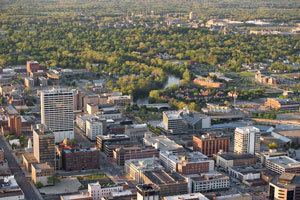 The focus will be on a number of initiatives currently underway between Notre Dame and the city of South Bend, including the MetroLab Network, Smart Cities Initiative and the Bowman Creek Educational Ecosystem. The panelists will respond to a series of questions from a moderator and time will be set aside for questions from the audience. Originally published by William G. Gilroy at news.nd.edu on September 26, 2016.